This tool compares two usrcheat.dat files to find the changes between them, and generates a changelog file. Requires .NET Framework 4.0. Source included. This tool uses UTF-8 encoding for all usrcheats. For English text, this won't matter, but it might for Japanese/Chinese text. If you're having problems, try converting your usrcheat to UTF-8 encoding. 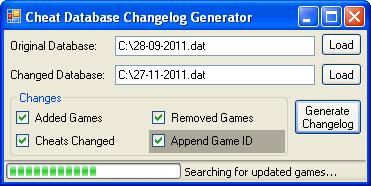 Cheat Database Changelog Generator 1.0 NEWEST!